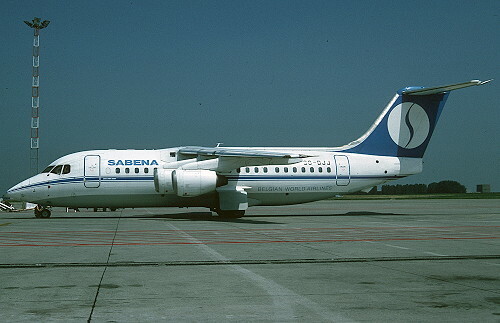 Description: the eighth and final Bae146 for DAT was delivered at Antwerp on June 28 1991. 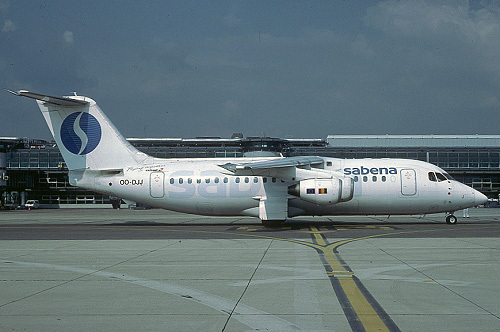 Depicted when operated on behalf of Sabena in their first (of three) color schemes. Description: second livery adopted by December 17 1995. Description: third livery adopted by July 30 1999. 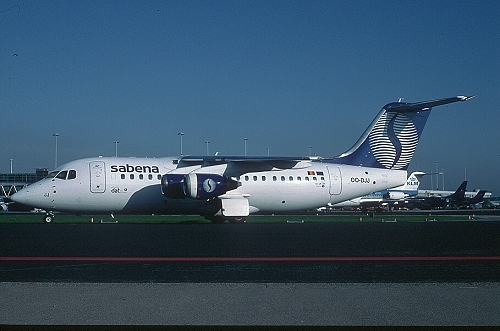 Description: transferred to SN Brussels Airlines during November 2002, and depicted in their final colors which were adopted on December 1 2004. 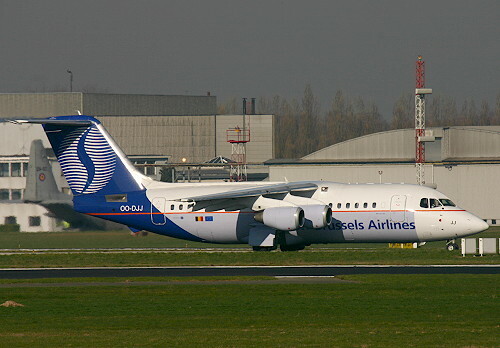 Description: the airframe was transferred to Brussels Airlines on March 25 2007 but remained active in the old c/s with only the internet address changed and "SN" painted out. Its last service took place on January 10 2008. 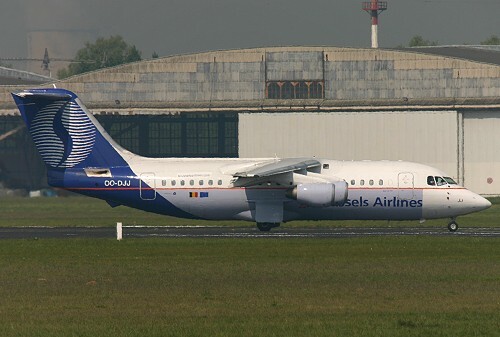 Description: on January 20 2008, it arrived at Brussels in AirDC markings, baptized "Favorite". 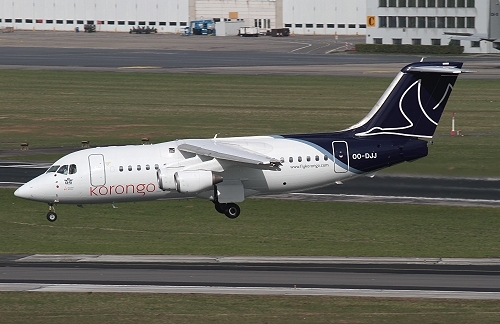 This new Congolese carrier was a proposed joint venture between HBA en Brussels Airlines for domestic operations in black Africa. Here captured during a training flight, the airframe was due to be operational as "3B-PAF" by Spring 2008. However the registration of this plane to a holding company in Mauritius posed troubles and was not accepted undermining the flying plans and the frame remained stored at Brussels. Description: while in storage, the AirDC titles were removed.. Description: on August 2 2011 it made a local test flight. 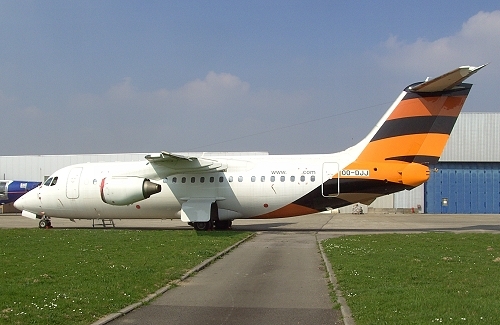 Between August 12-18 2011 it was at Norwich for painting in Korongo Airlines markings. It was temporary used again by Brussels Airlines on their intra European network till August 23 2012. Five days later it left for the Congo to its new operator. On February 7 2013 it came back to Brussels for further storage. On March 25 2013 it was cancelled from the Belgian register to "N193DD" and left for Canada six days later.